Fast food is about fast and nowhere is this more urgently true than for Drive-Thrus. The need is to make sure all the information is up front, accurate and easy to read, so customers can decide what they want and order it quickly. Nothing can make that happen more quickly and efficiently than a modern system of Digital Message Boards. Here’s why. 1- First and foremost, a modern system intimately links your POS system to your Digital Menu Board. You make a change in your POS, and whether it’s a change in price or an entirely new menu item, that information is instantly available. You don’t have to hire and pay a sign artist. You don’t have to wait for the sign to be completed and mounted. And, there is no possibility of miscommunications or mistakes. 2- You also gain tremendous flexibility. Do you have a daily special to offer? Do you have an item you want to showcase to complement an advertising campaign? You can make your customers aware of these great offers with a few clicks of a keyboard at no additional cost at all. 3- The benefits only increase if you are a chain of restaurants or a franchise. Modern cloud computing makes it possible for the home office to control many menu boards from anywhere. 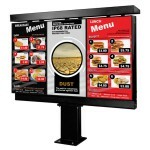 You can change every menu board company-wide, or perhaps only those in a certain geographic area. The choices are entirely yours. 4- Up-selling is made easier, too. Numerous studies have proven that fast food customers, especially drive-thru customers, respond strongly to pictures. Digital Signage is custom made to display picture to great effect. You can put your hottest new menu item, complete with a mouth-watering picture front, and centre in the middle of the board and hit your customers right in their taste buds for a knockout. 5- Costs are coming down, and the investment you make in your new Digital Signage System will quickly pay for itself. If cash flow is a problem, most vendors offer leasing and/or financing arrangements. Because you will be able to implement changes quickly and cheaply, you can experiment with menu options and pricing without costly delays, and watch your revenues soar!